Last weekend, Squib FX founder and inventor Steve Tolin was honored with an award from Steeltown Entertainment. Called the Elly Impact Award, it was awarded to celebrate the impact that Steve’s company Tolin FX has on the Pittsburgh film community. Of course a large part of the foundation that Tolin FX stands on is our blood work and squib rigs that we sell at Squib FX. We are really proud to be specialists in such a unique craft as blood effects and squib work, and even more excited by the impact it has on Pittsburgh and the US and even globally. Filmmakers, special effects artists and makeup artists the world over are able to include live in camera bullet hit effects in their projects without the fear of hurting someone or the costs generally associated with such an undertaking. 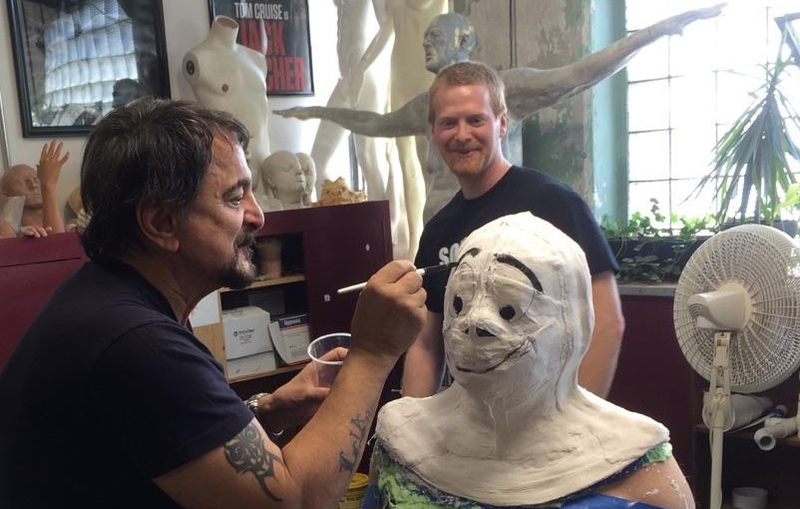 And the award was presented to Steve by none other than FX makeup legend and Pittsburgh icon Tom Savini! Tom has been working with Steve and Tolin FX very closely recently working on a Pinhead makeup for Doug Bradley, and he said a lot of really nice things about our operation and was a most gracious presenter. Also at the awards presenting to horror legend George Romero was Pittsburgh’s own Greg Nicotero. We spent a long time discussing the fine art of blood slinging with Greg that evening and we designed a new rig with him called aptly- The Nicotero. We are in development on that rig now and plan to have something in production in the next year. It was truly an honor to be recognized and singled out, but to be included in such a prestigious company as Tom Savini and Greg Nicotero and George Romero- there are no words for that. Thank you Steeltown Entertainment and thank you Tom!